- 2016-2017 drilling campaign now completed with 22 new holes and 10 wedge-cuts totalling 24,149 metres. MONTREAL, QUEBEC - Sept. 19, 2017 - Yorbeau Resources Inc. (TSX:YRB) (the "Company" or "Yorbeau") is pleased to provide an update on the Company's 100% owned Rouyn property ("Property") in Quebec, Canada, where its partner Kinross Gold Corporation ("Kinross") has now completed 24,149 metres of drilling. As a part of an option agreement (press release dated October 25, 2016) Kinross committed to spend C$3 million in exploration on the Property in the first 18 months, including no less than 12,500 metres of diamond drilling. Yorbeau is very pleased with the amount of drilling done by Kinross as part of the firm commitment. 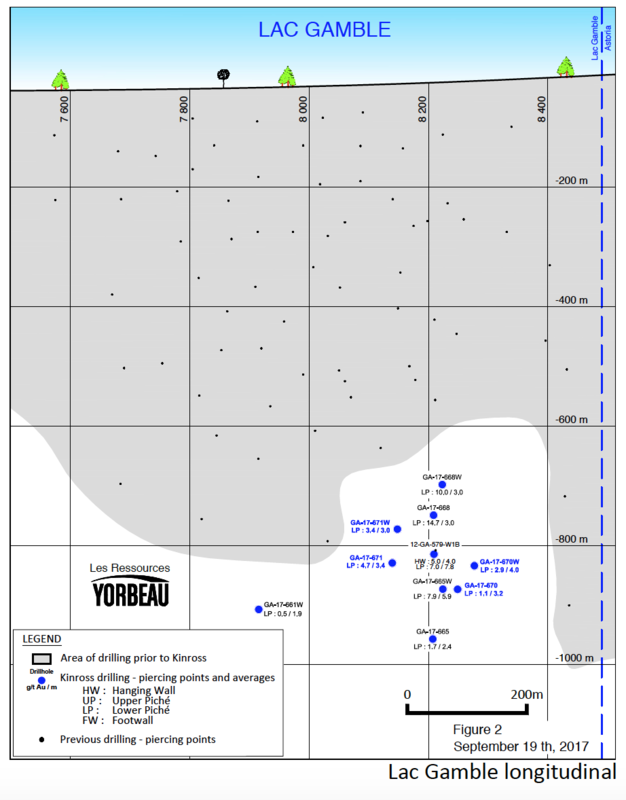 The Company considers that the large amount of drilling done within the C$3 million commitment reflects cost efficiency related to favorable project location and to cost control made possible by a great collaboration between Kinross and Yorbeau staff. The Kinross drill program focussed on the Astoria and Lac Gamble deposits with the aim of identifying high-grade shoots at depth within the broad mineralized gold corridor represented by the Piché Group. A recent intercept at Astoria in hole AS-17-678 suggests that the Footwall and Lower Piché zones may be merging at least locally, providing significantly wider mineralized zones. This newly interpreted zone called "Main Zone" returned high grade gold and supports potential to add significant resources at depth. Results are summarized in the table below. Drill hole locations are shown on the attached longitudinals (Figures 1 and 2). Note: gold grades reported below are uncut and depth intervals are core length. Core lengths are reported above. Horizontal widths range from about 75 to 85% of the core lengths. Gérald Riverin, Company president commented: "We are quite enthusiastic about the recent drilling results as they show local improvement in grade and continuity at depth. The possibly wider Main Zone at Astoria is the kind of grade and geometry we are looking for, and we are looking forward to finalize the new interpretation and see how it could impact the project ". Work at Yorbeau is carried out under the supervision of Gérald Riverin, PhD, P. Geo. He is a qualified person (as defined by NI 43-101) and has reviewed and approved the content of this release. 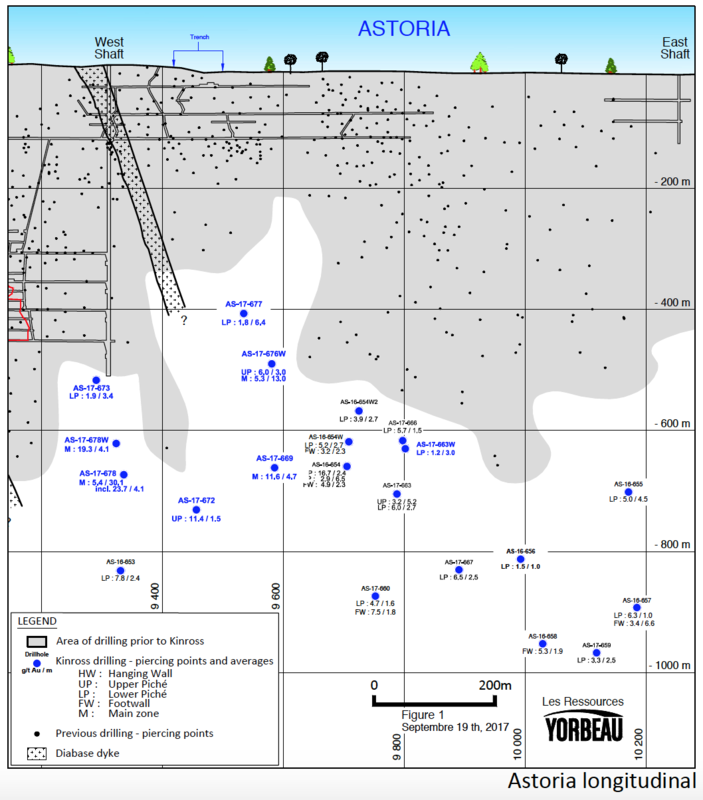 The design of the drilling program and Quality Assurance/Quality Control is under the control of Kinross' and Yorbeau's geological staff, including qualified persons employing a strict QA/QC program consistent with NI 43-101 and industry best practices. Drill core is logged and split with half-core samples packaged and delivered to Laboratoire Techni-Lab S.G.B of Ste-Germaine-Boulé, Quebec. Thorough QA/QC protocols are followed on the project including insertion of duplicate, blank and standard samples in all drill holes. All samples are analyzed by Fire Assay with an Atomic Absorption (AA) finish using a 50 gram aliquot of pulverized material. Assays exceeding 3 g/t Au are re-assayed by Fire Assay with a Gravimetric Finish. Samples with visible gold are processed with a special protocol involving fine grinding, followed by a four fraction metallic screen on the entire sample and analysis using a minimum of two 50 gram aliquot on each fraction.